Born to Build | John Cannon still enjoys working with clients to build custom homes. John Cannon collects cannons. But not by design. The cannons come from custom-home clients in appreciation for the detailed service ahead of construction, the finished product and the followup. His Lakewood Ranch office is a bit of a shrine to the cannon. The co-founder of John Cannon Homes attends client meetings, reviews wish lists, marks up house plans and visits job sites while homes are under construction. “We just feel that the better we can communicate, the better service we can provide our customer, the less misunderstanding, and the happier they are,” he said. Cannon launched his namesake homebuilding business with his wife, Phillipa, in 1987. Since then, John Cannon Homes has designed and built 1,400 luxury custom homes across Southwest Florida, 372 of them on waterfront lots. “This is where we live, this is where we build,” he said. Luxury doesn't come cheap. Cannon prices today start around $700,000 and can reach into the millions, not including the lot. Last year, Cannon produced 47 homes and did $60 million in business. Drew and Pam Trapani followed the customary Cannon client procedure. They bought a Gulf front lot on Siesta Key with “awesome” views and went to work with Cannon Homes, getting a property assessment for home-site suitability, answering a questionnaire, working with the architectural team on blueprints for a 5,000-square-foot home, sifting through the 4,000- square-foot design center and selecting everything they wanted, from fixtures to flooring and lighting to appliances. The Trapanis came up with a wish list two pages long. Clients know the cost of every selection upfront. Each element in the design center has a price tag. After they finish the design process, they get a price, not an estimate, of exactly what they'll pay for their home. “This thing was seamless right from the get-go,” said Drew Trapani, a retired orthodontist and professional drummer. “The final result is fabulous.” “Absolutely,” said Pam Trapani, who owns a golf business. The two are veterans of the home-building experience with four to their credit, including two in Venice. The full-time island residents have lived in the “retirement dream home” Cannon built for more than a year. John Cannon moved to Florida in 1979, right after earning a bachelor's degree in building construction from Michigan State University. The 61-year-old has lived on Siesta Key ever since. He worked for a national builder for five years before pursuing his dream of designing and building custom homes under his own name. When he decided the time was right to strike out on his own, he was just over 30 years old and a newlywed. At that time, Phillipa Cannon worked in a bank so they could make ends meet. The Cannons completed and sold their first home in Misty Creek in 1990. They quickly built three more homes and had built eight more within 12 months. 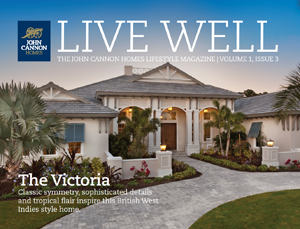 Today, homes by John Cannon can be found in more than 100 of Southwest Florida's upscale communities. In Sarasota County, those include the Forest at Hi Hat Ranch, The Founders Club, Prestancia, The Oaks, North Creek Estates, and Siesta Estates. In Manatee County, Cannon homes can be found in The Lake Club at Lakewood Ranch, The Country Club at Lakewood Ranch, The Concession, River Wilderness, and University Park Country Club. John and Phillipa Cannon continue to oversee every aspect of their company's operation, with Phillipa Cannon managing the financial side. John Cannon Homes is not a production builder interested in high volume, one who builds a neighborhood of homes based on a collection of floor plans, each with a limited variety of personal preferences. A custom builder like Cannon typically creates one-of-a-kind homes with a far greater range of design choices. Cannon also does not buy blueprints off the shelf, like some builders. The company employs architectural designers, not licensed architects, to create homes. “Every model that we’ve entered in the Parade of Homes for the 25 years since we’ve been here has been an original design,” Cannon said. Before designing a custom home, staff members follow clients as they walk through models and absorb their comments. “No two customers are the same and no two houses should be the same. You’re different from me — from budget to lifestyle to family size, to social life to hobbies," the builder said. Technology soon will play a greater role in the process. With images of a property in hand, the company will be able to incorporate the home design and the lot images into a three-dimensional model so clients can visualize their project. Front-end pricing Once all of the customer’s desires are incorporated into the design, Cannon prices out the house. He pre-purchases masonry, framing, drywall and other materials for a year. He knows the cost of all the design center selections. Cost overruns are Cannon's responsibility. Clients don’t have to worry about wrong or broken windows, for example. He will borrow money to build model homes. “But they usually sell rather quickly,” he said. When models are sold, buyers typically sign a lease-back agreement with a 4 percent to 5 percent return on investment for 18 months — “better than a bank,” he said. That way, future clients can do a walk-through to spark their imaginations. But with his company, subs don’t have to bid out a plan. “If they do a good job, I’m going to move them from job to job.” Subcontractors don't have to worry about getting paid, either. Cannon Homes delivers checks regularly, taking uncertainty and anxiety out of the equation. “I pay every 15 days,” he said. “I have never, ever, ever asked a sub to wait for his money, whether I’ve been paid or not.” With some other builders, subcontractors may have to wait two to three months for a check, so their crews have to wait, too. Ronald and Mimi Henderson are selling their North Creek Cannon home of 15 years, downsizing into an Osprey high-rise condo. “This house has been terrific,” Mimi Henderson said. “The quality is second to none.” They appreciate the attention to detail and the quality of construction, and they worked directly with Cannon. “John was a pleasure to work with,” Ronald Henderson said. Like the Trapanis, the Hendersons have had homes built in Venice and elsewhere.